Spectacular alpine landscape, Marmots, and gourmet food. What a combination the alpine village of Lech in Vorarlberg offers its visitors. Lech is a well-known up-scale ski resort. Furthermore, compared to its size it has an abundance of good restaurants. However, we went in the late summer first and foremost to enjoy some of the brilliant hiking you find in the area. Even though the weather didn’t really play along, it was good enough for a hike in the mountains. Properly clad for a grey day, equipped with a backpack with water, a first aid kit, extra clothes we headed up to the Rüfikopf at 2350 metres (7700 ft) with the Rüfikopf cable car. Taking the cable car up to mountain may seem a bit lazy, but we prefer spending time in the high mountains rather than hiking through the forests. Moreover, its free with the Lech Card. At the top you have a range of options for your hikes. 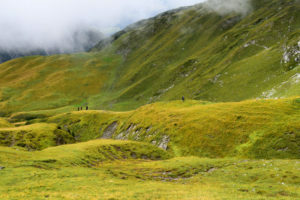 Moderate to difficult mountain top hikes, or moderate to difficult routes in the valleys. Nonetheless, as the weather was a bit unstable we hike towards Zürs, and turned around after about two hours, returning to Rüfikopf a slightly different route. 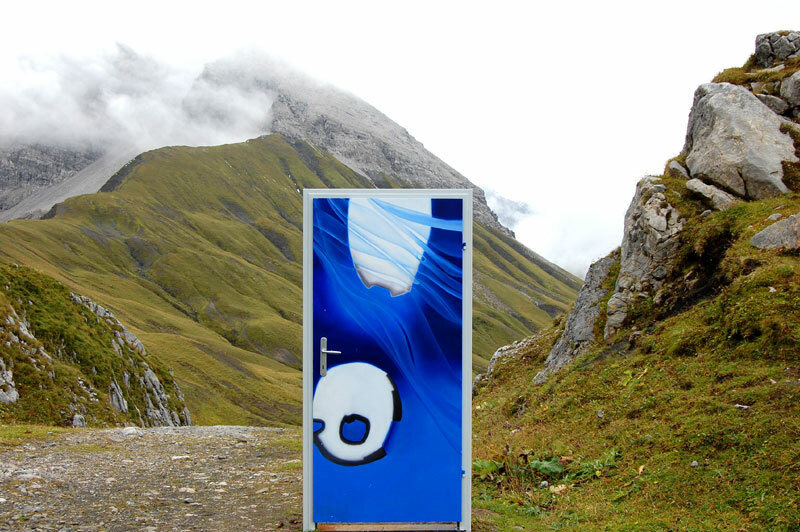 We expected to see spectacular scenery, but we stumbled across a surprise right in our path – a blue door – right there in the middle of nature. What a cool thing, and an obvious photo object. This is one of 9 doors placed around Lech as an art-project. They are taken away during the winter but will appear again next summer. 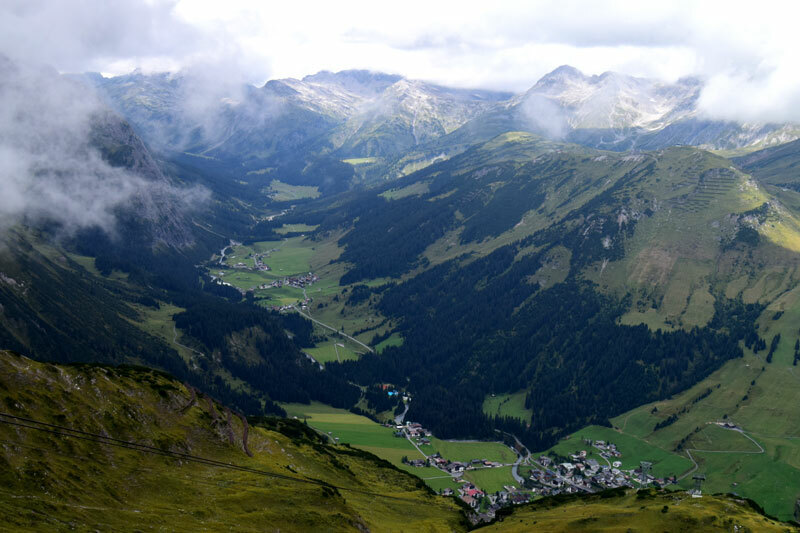 The clouds and sun played hide-and-seek with each other and gave us glimpses of a fantastic alpine landscape. The weather didn’t really call for a picnic that day, but that doesn’t mean you have to starve on a hike. Returning to the cable car station at Rüfikopf and the restaurant, it wasn’t difficult to choose an afternoon snack. Kaiserschmarrn has always been our favourite hiking food. You can’t really dislike the traditional Austrian sweet dish, which was one of Emperor Franz Joseph’s favourites. 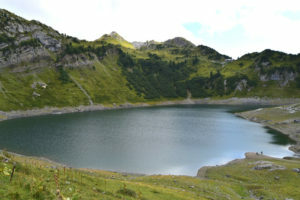 The next day we took advantage of the free bus service that is offered to holders of the Lech Card, and went up to Lake Formarin (Formarinsee), at 1,793 metres above sea level. 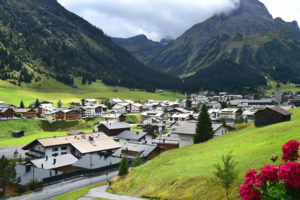 The 14-kilometre bus ride (Bus 7) from Lech takes you through several small villages Zugertal, before ending near Lake Formarin. 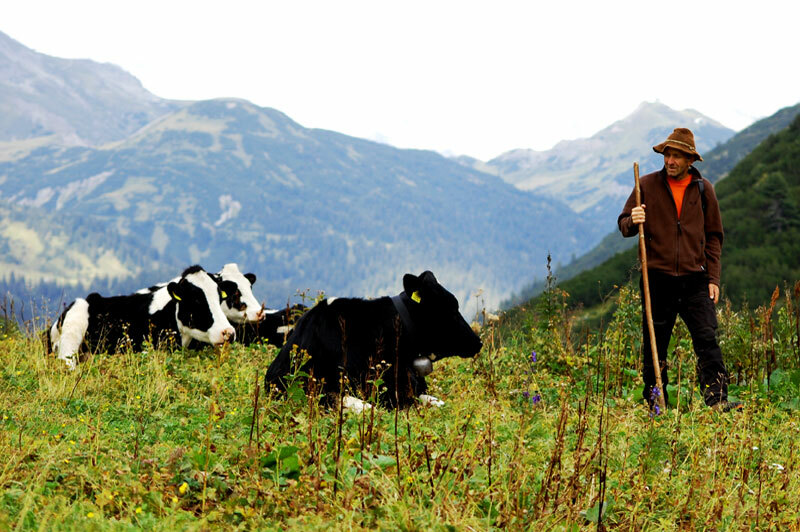 As soon as you leave the villages behind, you enter the realm of cows, which grass in the valley. Thus, you should count on some minor delays, as they might want to use the road as well. Although, the sun struggled hard to pierce the clouds again, the beautiful lake and its surrounding made a lovely backdrop for our hike. Making the around Lake Formarin hike offer you two options. Either to and from the Freiberger Hütte along the gravel road, or the slightly shorter but more challenging trail (Gipfelanstieg Saladinaspitze), that takes you around the east side of the lake. The Freiburger Hütte not only is a nice place to stop, but also gives you brilliant views of the mountains, both to the north of the Rote Wand and to Klostertal in the south. For more info on the around the Lake Formarin Hike, check out this interactive map. 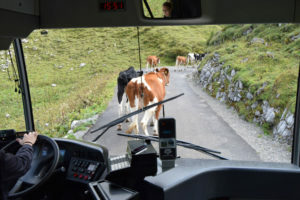 And yes, waiting for the bus back to Lech we had company at the bus stop from a bunch of pretty curious, but very friendly cows. They were not the only animals we encountered on our hikes around Lech. Aa bunch of far smaller, but faster fury rascals put on a show as well. We just love these little rascals, and it’s always fun to observe them when we hike. 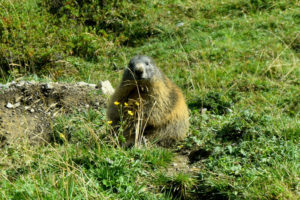 You often hear the alpine marmot before you see it. Until you learn how they sound they are easily confused with birds. Nonetheless, sometimes they pop out of their holes and start squeaking to each other. Often over distances of several hundred metres. They are all over the place. We saw several of the funny critters when we were hiking at Rüfikopf, and again from the bus to the Formarinsee. The driver spotted it and stopped so we could have a close look, as the marmot sat 3-4 metres from the road and had its afternoon snack. Don’t let the exclusive reputation put you off. 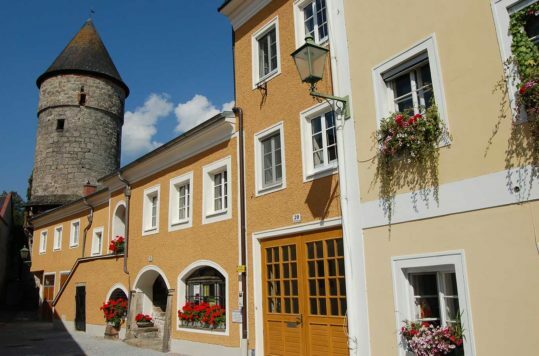 Lech is an affordable destination in the summer season. There is a good choice of affordable eateries as well. Even though some restaurants close in the summer, you can still try a new place every night. Lech, which straddles the banks of a river with the same name, offers pleasant evening strolls. 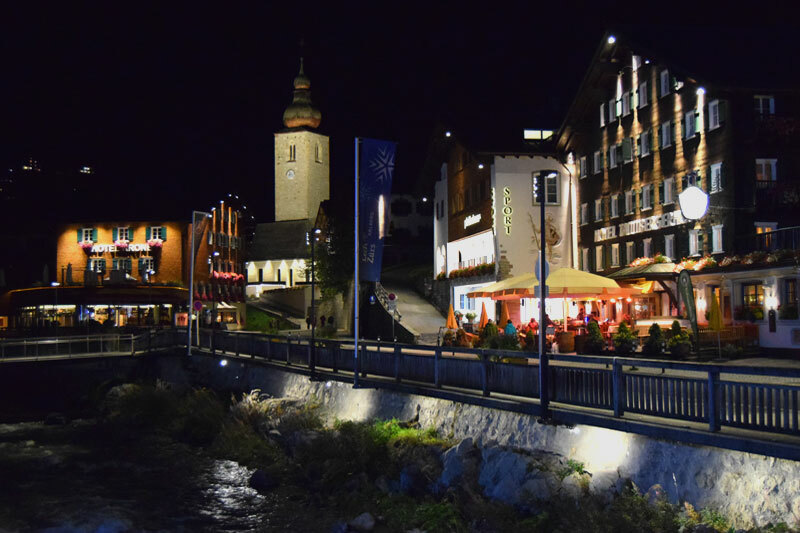 There are also some good eateries in Oberlech and Stubenbach, reachable with the local bus. 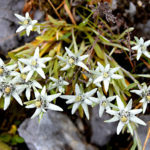 We’ve done plenty of hiking in Austria, but this is the first time that we found the Edelweiss just outside the cable car station at the top. Although not rare, they are hard to find near well-travelled places and trails. Thus, it was a surprise to find it just next to the cable car station at Rüfikopf.